Love Locks on the Hohenzollern Bridge, Koln. Other than in the surname of the brilliant independent scientist James Lovelock, I’d never come across the term “love lock” until a couple of days ago. Then, by chance, I found it on the internet – where else, these days – and it perfectly described what I had seen earlier in the week on a footbridge in Koln, Germany. It was intriguing subject matter, but I saw I was not the only one with the same idea. How could I “add value” to an interesting but straightforward image? I had a short session with the camera at and after sunset. Down on my haunches I photographed the love locks with the railway behind them from the other side of the bridge as, almost by accident, a couple carrying a baby passed in front of me. It was a quite spontaneous pressing of the shutter; the idea or intention had not entered my conscious mind. It had been almost dusk and I was using a slow-ish shutter speed and a wide aperture, so I couldn’t be certain the image had worked. The next morning I returned with the intention of replicating it, but this proved to be difficult. In the bright light of morning pedestrians could see me clearly and stopped to let me take my picture before walking past – they didn’t realise I needed them in it! I would wave them on but sometimes it’s just impossible to re-create a special photographic moment, even if all the elements are all present, so it was fortunate that the evening’s couple turned out to be perfect. 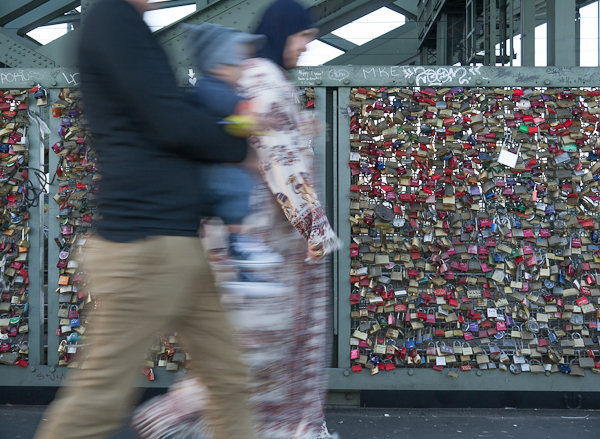 I read on the internet that attaching “love locks” to bridges or statues (and throwing away the key) is a trend of recent but unknown origin, which has taken root in several European cities, including Rome and Paris, in very much more romantic locations than the Koln example we came across. Sometimes they are removed by local authorities (citing Health and Safety perhaps….) and in Koln this had been proposed but residents protested and they are still there. What possible problem could they cause, I wonder? In my opinion “love locks” are wonderful idea.